Happy Friday and welcome back to your weekly Just another Friday at ABG Capital! Today marks one week down for those who are competing in our biggest losers challenge! They still have 7 more to go, but we’re supporting every employee 100% of the way. This isn’t just about losing weight, this is about taking care of your body and starting a healthier lifestyle. This week’s challenges week’s challenges for the contestants were to drink more water and to track the minutes of exercise worked. One App that we recommended to everyone was called Water Your Body Lite. It takes your weight and then calculates how much water you should be drinking every day. Do you think you’re drinking enough water? The winner is one of our Billing Representatives, Nick Jenkner. He accumulated 7 hours of exercise this week! Nice job! We also want to give a huge shout out to our Office Administrator, Sara Warhold, for driving this competition. Sara has an extensive background in this realm since she was a group fitness instructor for 8 years and was teaching 5 to 6 classes a week. She really knows her stuff and is a fantastic in-house resource for those who are trying to build healthier lifestyles. To help out those participating in the contest, and also everyone reading this post, Sara provided us with a workout and healthy recipe for you to try out. She provided two variations of the workout since there are all different fitness levels out there. For the workout, you’ll need a set of hand weights (dumbbells) and if you’ve never used resistance training, we suggest starting with as little as 3 lbs. or omit the weight all together! Set timer for 2 minutes: 30 second march in place, 30 second alternating toe touch, 30 second step side to side, 30 second march in place. In a standing position, arms above head, bring one knee up as you pull both arms down toward the knee. Try to touch your elbows to the knee. Alternate legs. Do each leg 10 times. Cool down by doing some side to sides until your heart rate settles, STRETCH!! Set timer for 2 minutes – 30 seconds on all fours, knees spread wide, rock back & forth for a deep hip stretch, bear weight through hands, 30 second laying on stomach, tilt head up breath IN, look at the floor breath OUT, on your feet 30 seconds alternating toe touch, 30 seconds jog in place. Cool down with some side to sides until your heart rate settles, STRETCH! Preheat the oven to 450 degrees. Spray baking dish (about 8×8) with cooking spray, set aside. In a food processor, process the crushed tomatoes, chicken broth, basil and garlic. Pour pureed tomato sauce into a medium saucepan and bring to a boil over medium-high heat. Stir in the pasta, olive oil, oregano, salt, and pepper. Heat for about 5-8 minutes. Line the bottom of the baking dish with a layer of tomato slices. Pour the pasta and tomato mixture into the pan, over the tomatoes. Arrange the remaining tomato slices in an overlapping layer on top of the pasta mixture, making sure the mixture is completely covered. Season with salt & pepper, drizzle with a little olive oil. Bake for 25-30 minutes until the tomatoes are nice and crispy and pasta is cooked. In staying with our healthy lifestyle themed week, we had a great Lunch and Learn that featured a Yoga and Meditation workshop that was instructed by Adrienne Totino. During the workshop Adrienne covered a few different styles of Yoga along with the specific benefits of practicing it. There’s more to Yoga than deep breathing! It’s a technique that can help healing physical ailments, reverse disease, reduce stress and anxiety and also balance emotions. The best part of the workshop was that we actually had a mini Yoga class where we learned some great stretches that we can do right from our desks! It was an overall great afternoon in the ABG Capital office. 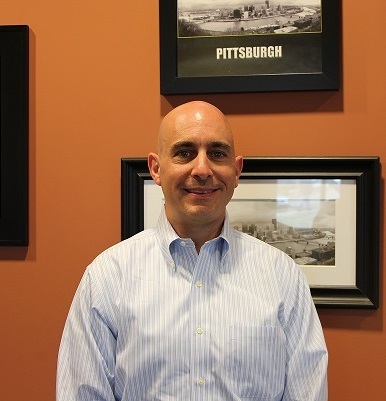 As we close up this week’s Just another Friday at ABG Capital, we want to show our love for the Pittsburgh Pirates! They play the Milwaukee Brewers tonight at 7:05 and to show our support, we were sporting our best Pirate gear today. Let’s go Buc’s! It’s safe to say that our office will be receiving a face-lift very soon. We’ve been mentioning that we put together an office decoration committee and we’re happy to announce the materials for phase one of the whole office redecoration project have been sent off to the printer. We’ve gone through tons of ideas and edits and then more edits on top of that. The next step is to get the materials from the printer and start placing them on the walls. We are going to have three huge pieces and then some smaller things ready to go for our open house on November 1st. Since that dates getting close, we can give you an idea of what these three huge pieces are going to be. One is going to be a giant clock that represents the 12 Chimes of Life. The second one is a giant tree that will highlight employees and other things that matter at ABG Capital. The last, and probably the most exiting piece included in phase one, is a giant (26ft long) timeline that walks you through the lifetime of ABG Capital. These things are going to look amazing in our office and we can’t wait for them to be finished. This week we also had a visit from Robin at Sunnybridge Natural Foods. She gave a great presentation on how health and wellness can be achieved through nutrition. The session was topped off with lunch and Sunnybridge gluten-free bakery treats, which everyone said were yummy! On Monday we welcomed a new employee, Trichelle Barish, to the ABG Capital community. Trichelle was hired as the new Provisioning Representative for VoIP Innovations. Everyone help us in welcoming Trichelle! The next piece of news that we have to share is about Halloween. We’re looking forward to the costumes and candy that are going to fill the office on our Halloween Party! Not only are we going to have a Pot Luck lunch, but we’re holding costume contests. There will be a prize for the best woman, best man, scariest and funniest costumes. There will definitely be pictures of the winners along with all of the other festivities that we’ll have going on. If you remember from last week we were cheering on our Pittsburgh Pirates as they were making their way through the series against the cardinals. Unfortunately, our excitement didn’t last much longer because last night’s game proved to be the end of truly great season. It was a sad night in Pittsburgh, but it’s safe to say that this season was legendary. See you next year Buccos! Happy Friday from ABG Capital! Before we get into any company updates, we just have one thing to say… LET’S GO BUCS! If you haven’t heard, the Pittsburgh Pirates made the playoffs for the first time in 21 years. Needless to say, it’s an exciting time for Pittsburgher’s. There was even a guy who was so excited after the Buccos won the wild card game, that the only way he could express that excitement, was to jump off the Clemente Bridge! The second playoff game in St. Louis starts at 1:07 today and you’ll probably be able to catch some employees watching the game in our new conference room! Now that we got that out of the way, we can start talking about some ABG Capital news. Since it’s the beginning of Buctober… oops… we mean October (had to sneak another Pirates reference there :)), we want to give a shout out to all the October birthdays and anniversaries. For birthdays we have Tim Linn on October 6th and Jacob Crisman on October 24th. For anniversaries we have Sebastian Kiely celebrating 7 years on October 19th and Randy Stegner celebrating 4 years on October 26th. We want to wish these employees a happy birthday and happy anniversary! Speaking of anniversaries, our newest employee Cameron Nutter just got to spend his one month anniversary at the Rivers for lunch with Jeff and Jason Tapolci. Cameron is working with VoIP Innovations as a Technical Support Representative. Congrats on hitting your one month mark Cameron! Our brand new vending machines. The TV and lounge area in our new conference room. This is where you’ll see us watching the Pirate game today! One of the new offices that’s almost ready for its’ owner to move in. 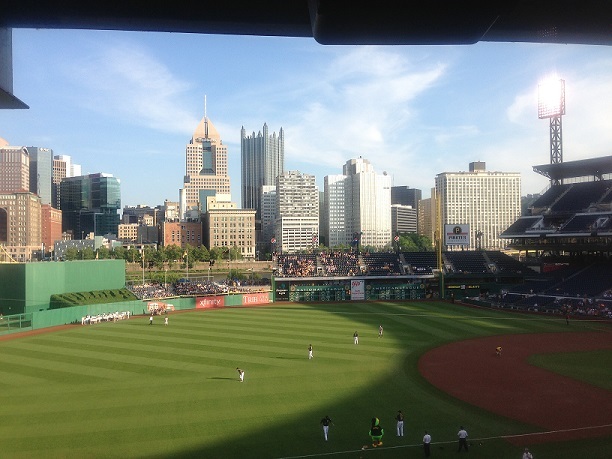 Jeff and Ron were invited by Kieran O’Dea, from Alpern Rosenthal, to spend time outside of the ABG Capital office doing some networking at a Pittsburgh Pirates game. Kieran is currently a shareholder in the Audit and Assurance Department and he specializes on privately-held manufacturing, distribution and service companies. Kieran didn’t intend for this to be any sort of formal networking event; he wanted to invite a few colleagues and enjoy the ball game. Among the invitees were lawyers, bankers, PE guys and a few other people from his firm who all enjoyed getting to know each other in the casual setting. They even ended the night with a great win for the Pirates! Everyone can relate to the feeling of being a new employee, but Jeff and Jason decided long ago that they really want to get to know the new ABG Capital employees they hire. What better way to do that than by taking them out for a nice lunch at the Rivers Club! It’s a great way to put the office pressures aside have some good conversation over delicious food. Check out the Inspira Facebook page to see how great Jeff, Jason, Collin and Kathy looked! Jeff got a picture of Michael Schenk in action! You may or may not be aware that we are in the midst of a nationwide health care reform. Many things will be changing in the coming months and it’s going to affect organizations and the health care plans they provide to their employees. Jeff and Sharon, our HR Manager, were invited by Sean Andreas, our Insurance Rep, and Ben Witsberger, our Business Banker who are both from Wells Fargo. The event was called, “Health Care Reform: Strategic solutions to address the play or pay mandate,” and featured Michael Schenk, a Benefits Compliance Consultant at Wells Fargo. Michael talks about the Affordable Care Act (ACA) and its effects on employer-provided health plans. 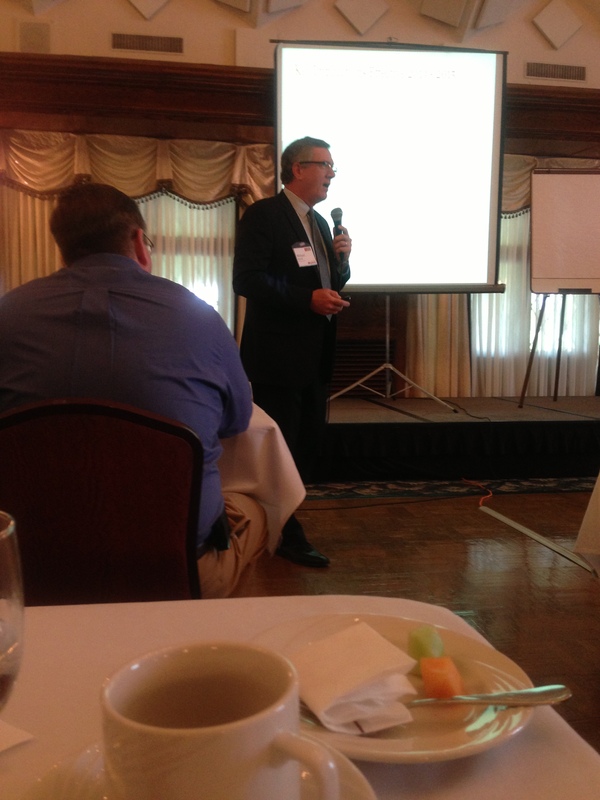 The main topics that he covered in his presentation were the provisions going into effect next year and their impact on employers and group help plans, what strategies can minimize the financial impacts of the ACA and how to maintain a legally compliant program that is still competitive enough to attract and retain top employees. Jeff and Sharon attended this event so they can be better resources for their employees who may have questions on how the health care reform will affect them.